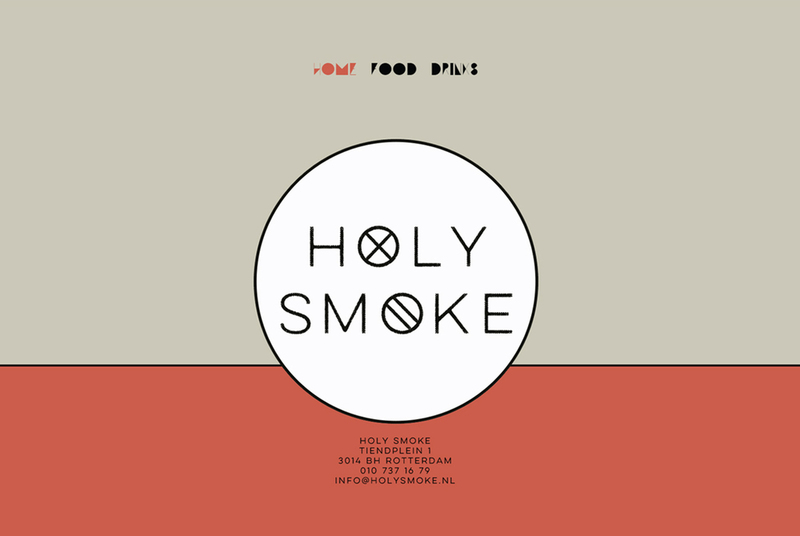 Studio Modijefsky was invited to design the interior of Holy Smoke; a new Bar/Restaurant in a historic building on the corner of Tiendplein, Rotterdam. Previously the building was divided into two commercial spaces; one of which was a cigar shop. As part of the recent renovation these spaces have been combined into one brighter space. With windows on all three sides, the space offers great visual connectivity with the square and the neighbourhood. Studio Modijefsky has used this quality to enhance the interior; the openness is reflected inside. The space has an orientation towards the street and towards the square; centrally positioned, the bar strengthens this concept. Around the bar, the rest of the space forms itself, consisting of an open space on the ground floor, a souterrain and an entresol area. Analyzing the features of the existing building, such as the curved window frames, the shapes and forms derived from this analysis has been used to create an identity for the new restaurant. A combination of lines and circles has been used to define the space with handrails, dividing panels, staircases and frames.Belgian limestone, which has been used on the original façade of the building has been brought in and used in the interior, creating a stroke on the floor and shaping the bar.Other interior elements such as the wainscoting on the walls, and the custom made lamps which compliment them, refer to the previous use of the space; the cigar shop. The most outstanding feature of the interior is the bar with an army of lights hanging above it. Cylinder light tubes emphasize the glass rack while round light bulbs hang between metal plates above the coffee corner and bar front. These shapes also relate to the graphic identity of the space. The choice of furniture has been carefully made considering the different zones created in the space. A lounge area is designed in the lower split level and is furnished with a leather bench and seats with small round tables. A dining area in the entresol consists of a wooden table against the railing looking out into the interior and square zinc tables with leather chairs. A group table stands in front of the bar and creates a line between the dining and the bar area on the ground floor. A unique use of color, form and material can be seen throughout the space, red steelwork frames following the borders of the split level creating a distinct atmosphere. The kitchen on the other hand is framed with a marble block and steel panels and stands next to a mirrored staircase leading downstairs to the bathroom. The diverse use of materials continues into the bathroom. A toilet sign cut out of steel directs the customers to the lower level. Descending down they arrive in a green tiled soothing space, where forms and graphics appear in arch shaped mirrors and toilet roll holders. Materials such as white tiles, steel stripes and wooden planks continue from the ground floor into the toilets. 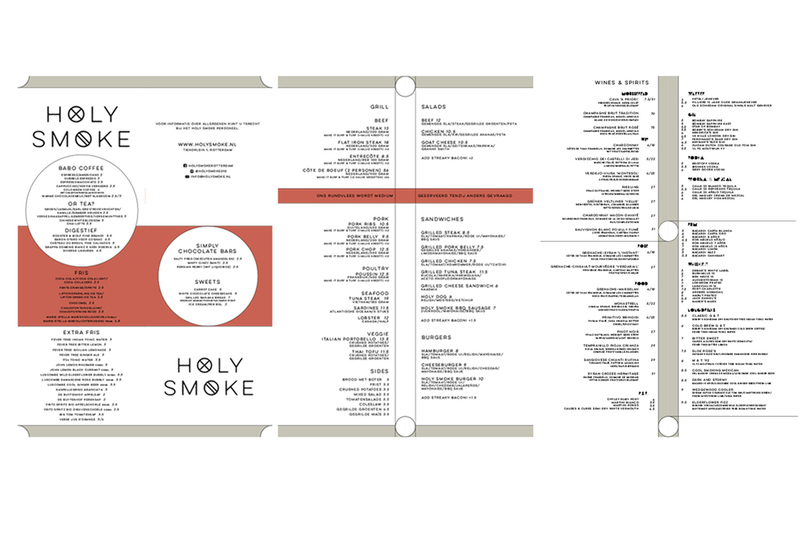 Menu, website, logo and identity design of Holy Smoke has also been completed by Studio Modijefsky. The same geometry that shapes the space compliments the graphics used in the menu design. Arriving from the street, round red and grey sunshades cover the arched windows while revealing a glimpse of cylinder lights lined up above the bar. The graphics appear once again on the façade and long windows urging the viewer to step inside and experience the Holy Smoke.